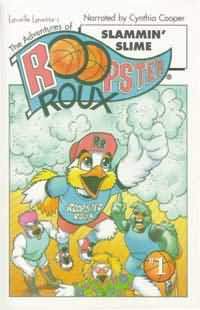 The first story in this hot new series introduces children to Roopster Roux, one “cool doodle-doodle doux” who loves reading as much as sports. In his first adventure, Roopster wonders if he will start in the upcoming basketball game. His coach told him that in order to start, he would have to learn how to slam dunk, but dunking has posed a bit of a problem. Soon, dunking is the least of Roopster's concerns after he overhears the evil Tegore's plans to take over the town, and the world, with his stinky green slime. With the help of Mr. Figby the librarian, Roopster might just be able to stop Tegore. But will he be able to slam dunk? Cynthia Cooper, the 1997 MVP of the WNBA hampion Houston Comets, narrates the audiocassette version of this first adventure. Ms. Cooper also was a member of the 1988 and 1992 U.S. Olympic teams and won, respectively, gold and bronze medals. Before joining the Houston Comets, she played professional basketball in Italy for ten years.